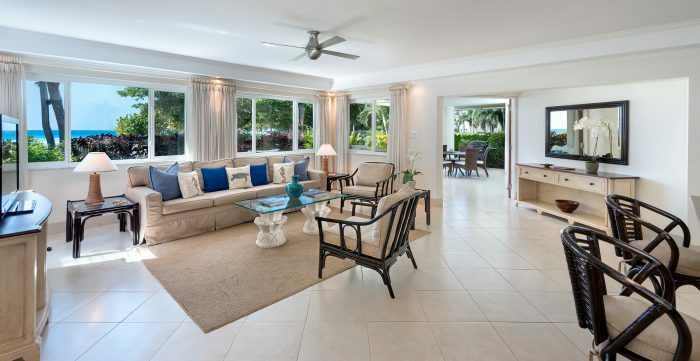 This beautiful three bedroom ground floor condo located in Hastings, along the South Coast of Barbados, makes an ideal choice for any holiday, be it a family vacation or quiet romantic getaway. Palm Beach is a prime Barbados beachfront location, yet is also close to all kinds of amenities giving you the best of both worlds – you can join the hustle and bustle of the popular South Coast via the Boardwalk, or relax and take a quiet break from it all. An elegant combination of style and design, Palm Beach 110 offers an airy open-plan design that encompasses a well equipped modern kitchen with a casual dining area at the granite countertop, and a spacious living area with comfortable seating that flows seamlessly onto a large covered patio. The patio offers additional seating as well as a spacious outdoor dining area. Being on the ground floor, the patio also offers easy access out to the deck of the community pool where you will find plenty of sun beds and umbrellas nestled in a central garden area. Direct access onto beautiful warm golden sand of Palm Beach is just steps away from the edge of the pool. 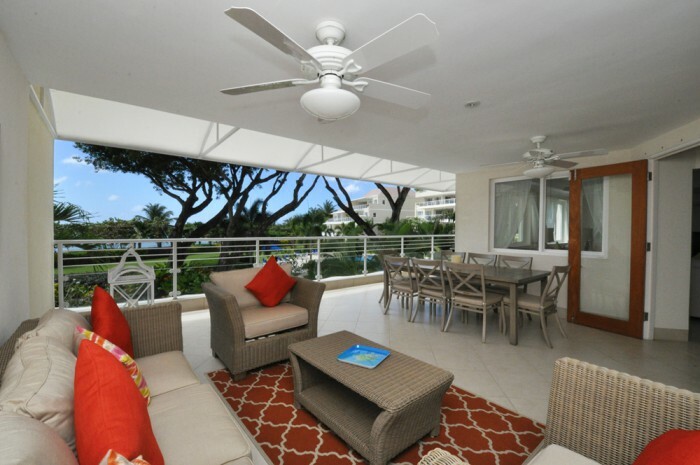 Each of the three bedrooms of this beautiful beach rental condo is air-conditioned and en suite. The master bedroom suite has a king size bed and opens directly out onto the covered patio. Bedroom 2 has twin beds that can be made into a king and bedroom 3 has a queen size bed. The couch in the living area can also be converted to a sofa bed. Smoking not permitted indoors or on the patio. Housekeeping service is provided two half days a week. The Condominiums at Palm Beach is a private gated community with all the flair and amenities of a luxury West Coast project. It is not a resort and hence does not provide resort type services. The development is primarily a private residential complex where some owners participate in short term rentals. The primary objective is to ensure the peaceful enjoyment of the property by all residents. If you only require two bedrooms, consider Palm Beach #405 with spectacular views.